Mount Katrin ORS - A nice view towards St. Wolfgang from mount Katrin / Bad Ischl. Bad Ischl: PANOMAX Katrin Seilbahn - Katrin Summit, 0 mi. Bad Ischl: Katrin, 1.8 mi. 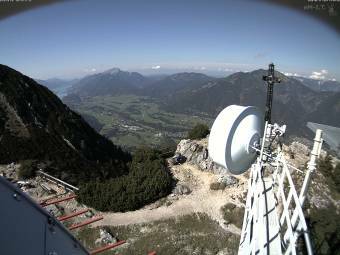 Bad Goisern: Webcam RHV Hallstättersee, 3.8 mi. Bad Goisern: PANOMAX Bad Goisern am Hallstättersee, 3.9 mi. Strobl: PANOMAX Strobl am Wolfgangsee, 5 mi. St. Wolfgang: Lake Wolfgang WebCam, 7 mi. St. Wolfgang: Gästehaus Pension Menkens, 7 mi. Postalm: PANOMAX Postalm, 7.1 mi. This webcam Bad Ischl with the theme Landscapes was added on October 6, 2014 and is operated by eM-I.T.. It got 318 visitors since then. Shouldn't this webcam work or should the link be wrong please report that here. You can add this webcam here to myCams.